As you may have heard, the NC Department of Environmental Quality (DEQ) announced recently that it will order a full cleanup of every coal ash pit in the state! This is truly one of the biggest environmental victories of our era. As if that wasn’t enough, last week Duke Energy announced that it has indefinitely postponed the construction of a 190-megawatt gas-fired peaker plant on Lake Julian, removing it from its list of future projects. For six years, MountainTrue members kept the pressure on Duke Energy and the state Department of Environmental Quality to clean up the coal ash mess and to move beyond fossil fuels toward more efficiency and renewable energy. You are part of that legacy. Your support held Duke Energy accountable. These victories are an important reminder that your activism can change the course of history. When you stand with MountainTrue, you fight for our environment. Will you stand alongside MountainTrue this Earth Day? Whether you’re taking action in the field, making conscious decisions in your daily life that lead to a sustainable future, or making contributions that invest in a lasting impact, we celebrate you for being part of a community that is making a difference this Earth Day. By donating to MountainTrue, you safeguard public lands, advocate for the common good in the halls of government, protect our waterways, and help build a sustainable future in the face of climate change. In honor of Earth Day, act locally by making a contribution to MountainTrue today. With your donation, you will be helping to fight for future successes like these. Thank you for being part of MountainTrue and making this work possible. Cliffside, N.C. – On April 1, North Carolina’s Department of Environmental Quality (DEQ) announced that they will require full excavation of all coal ash impoundments in NC. As a result, a total of nine coal ash pits at six coal-burning plants – Allen, Belews, Cliffside/Rogers, Marshall, Mayo and Roxboro – must be fully excavated and moved to lined landfills. Below are statements from MountainTrue’s Broad Riverkeeper, David Caldwell, and MountainTrue’s Co-Director, Julie Mayfield. “This is a huge victory for clean water and the health of communities living near coal-burning power plants in North Carolina. DEQ has proven their mettle, showing the people of our state that they intend to do their job of protecting our water and environment. They have shown big business and industry that polluting our water is unacceptable, and that polluters will be held accountable. This has been a long battle for frontline communities, which have shouldered the burden and the risks associated with coal-fired power for decades. I personally became involved in the fight to clean up coal ash in 2014, and started the Broad River Alliance in 2015. In 2016 I attended the first of DEQ’s public input meetings regarding Cliffside, joining over one hundred concerned local citizens who stood up and spoke out for clean water. We asked DEQ and Duke Energy to do the right thing and dig up the ash that has been sitting in our groundwater and leaking dangerous contaminants into the Broad River. “MountainTrue is so grateful to DEQ for listening to affected communities and heeding the science showing that full excavation is the only safe option for coal ash closure in our state. MountainTrue and the Sierra Club launched the focus on coal ash in North Carolina in 2012 as part of the Asheville Beyond Coal campaign. 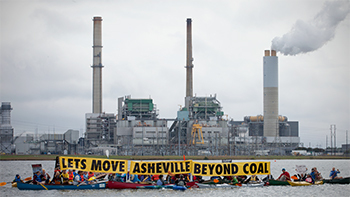 Through that campaign, we secured the forthcoming retirement of Asheville’s coal plant on Lake Julian and the full excavation of those coal ash ponds. This put Asheville’s air and water on a pathway to a cleaner future, but the future for the people and environment in Cliffside and other frontline communities across the state were until now uncertain. This historic decision by DEQ will change all of that. Protect the Clean Water Act from Industry Polluters! On January 22, the NC Department of Environmental Quality (NCDEQ) will host an information session and receive public input about coal ash pond closure options for Duke’s Cliffside plant. The input they receive at this meeting and through public comments will help decide whether NCDEQ enforces a full cleanup of Duke Energy’s coal ash or allows them to leave it “capped in place” at the site. What’s Happening With Coal Ash at Cliffside? Duke Energy’s coal ash pits at its James E. Rogers Energy Complex – more commonly known as the Cliffside Steam Station – store millions of tons of coal ash waste in a pit that extends approximately 80 feet deep into the groundwater table in violation of federal rules. Located in Cliffside, N.C. on the border of Cleveland and Rutherford counties, this waste is seeping into the Broad River, and polluting the groundwater with toxic heavy metals like arsenic, mercury and lead. In December 2018, Duke acknowledged another violation of federal rules intended to protect people from coal ash contamination – surpassing the federal groundwater standards for arsenic and cobalt. This is one of many legal violations at Cliffside related to coal ash storage, and Duke’s noncompliance means seepages around the impoundment are getting into wetlands and streams, and ultimately the Broad River. Duke Energy wants to leave its coal ash right where it is – in massive unlined pits seeping into the groundwater and the Broad River, and polluting the groundwater with toxic heavy metals. “Cap in place” simply means that the coal ash would be covered up but would remain in the groundwater table, causing permanent pollution of groundwater and migration of pollutants to surface water and the Broad River. To comply with the law and protect water quality, Duke must excavate the coal ash now. Duke Energy is already required to remove its coal ash at eight other sites in North Carolina and all of its sites in South Carolina –Cliffside’s families and community deserve the same protections. NCDEQ needs to hear us loud and clear: We need cleanup, not cover-up! 1. Come to the North Carolina Department of Environmental Quality’s public information session on Jan. 22 in Forest City to call for cleanup, not cover-up, of Cliffside’s coal ash. Find the details for the event here. 2. Take action here to tell NCDEQ that Duke’s coal ash should be moved out of the groundwater, away from the Broad River, and into the lined landfill on their property. Asheville, NC – As part of #WNCforthePlanet – a celebration of Earth Day throughout the month of April – local conservation and environmental nonprofits are recruiting businesses, civic groups and community organizations to take part in the Business & Community Challenge. Through this competition, groups compete with each other to earn Planet Points and work for the improvement of our local environment. The #WNCforthePeople Business & Community Challenge is open to area businesses, civic organizations and community groups, who then recruit teams from among their members to compete for prizes and bragging rights. Companies interested in getting involved should contact Devon Hathaway, Americorps Outings and Education Coordinator at MountainTrue at outings@mountaintrue.org or by calling (828) 258-8737 ext. 214. Teams commit to one or more service projects throughout the month of April and are paired up with a #WNCforthePlanet partner nonprofit organization which will provide staff guidance and equipment for a day of working on behalf of a cleaner and greener WNC. Groups earn Planet Points according to how much they accomplish and the strenuousness of the project. Each team’s score is calculated according to a difficulty scale and averaged on a per-person basis. At the end of the month we tally the Planet Points, rank teams, name victors and hand out awards and prizes. Available service projects include river cleanups, native habitat restoration, trail workdays and more. The team with the first, second, and third most Planet Points will choose from prizes, including a river float with MountainTrue, RiverLink and Asheville Greenworks, a hike led by the Southern Appalachians Highland Conservancy, or a private tour of New Belgium Brewing. Victors will honored on wncfortheplanet.org and through the social media of participating #WNCforthePlanet partners. Register your team today. Contact Devon Hathaway, Americorps Outings and Education Coordinator at MountainTrue at outings@mountaintrue.org or by calling (828) 258-8737 ext. 214. Support Local, Sustainable, Farmers From Your Watershed This Holiday Season! The following post is by North Carolina’s Riverkeepers through the Waterkeeper Alliance. A lot of folks in North Carolina produce meat. The state ranks second nationally in pork production and is among the nation’s leaders in poultry production. But the way meat is produced makes a big difference. Corporate-controlled industrial animal operations are one of the leading contributors to water pollution across North Carolina. But there are farmers throughout the Tar Heel state striving to provide high-quality food without harming their local communities. And they deserve our thanks and our business. Waterkeepers across North Carolina have compiled a list of farms in their watersheds that feed us without threatening our rivers, lakes, and streams. The inventory at these farms varies, but they all have one thing in common: they’re trying to do things the right way. If you’re looking to buy a bird for your Thanksgiving feast, we encourage you to buy from one of the farms listed below (we recommend calling to reserve your bird now). And if you aren’t able to buy directly from a farmer, be sure to look for their products at farmers markets and grocery stores in your neighborhood, as many supply to local distributors. This holiday season, let’s show our appreciation for environmentally conscious farmers who raise meat sustainably and humanely using traditional techniques. Please choose to make your holiday meal even more special by purchasing from true family farms and pledging to buy sustainably-raised meat this holiday season. And when you make your purchase, be sure to thank the farmer for taking steps to protect our environment! Pledge to serve sustainable meat this holiday season here. *Don’t see a sustainable farm in your community on this list? Please let us know!